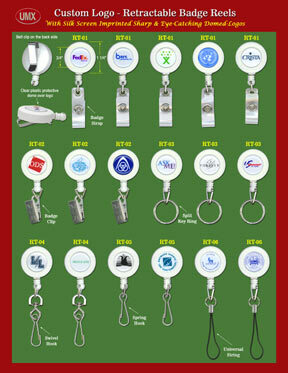 Custom Logo Retractable Badge Reels for Name Badges or ID Card Holders. 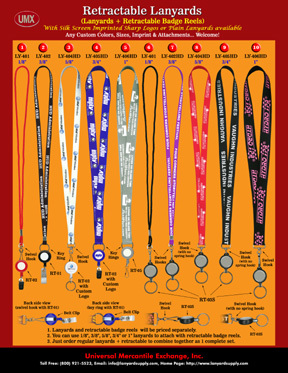 Lanyards > Badge Reels > Custom Logo Imprinted or Laser Cut. 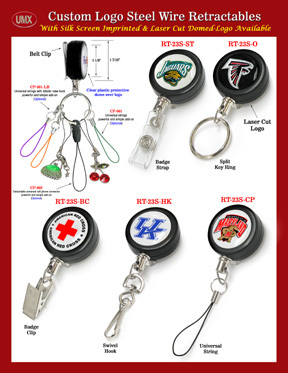 Retractable badge reels are great for printing company logos, web addresses, phone numbers, security ID messages, promotional advertisements, or personalized artworks. 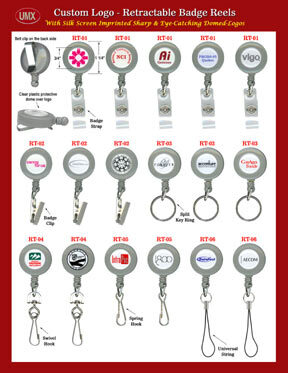 There are two methods to print logos onto badge reels: either by silk screen imprinting or by laser cut. After the logo has been imprinted or laser cut, it will be filled with clear epoxy domed cover to protect your logo from chipping off, and to make the logo look larger and more eye-catching. 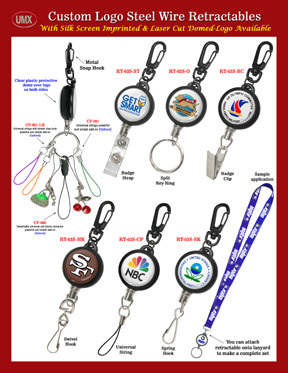 The outstanding custom logo will make your retractable badge reel superbly impressive! 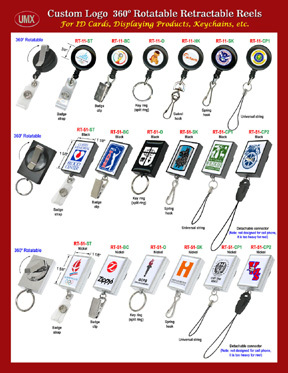 We offer a wide selection of attachments, including plastic badge holder straps, badge clips (bull-dog or alligator clips), key-rings (split-rings, keychains), swivel hooks, or spring hooks. 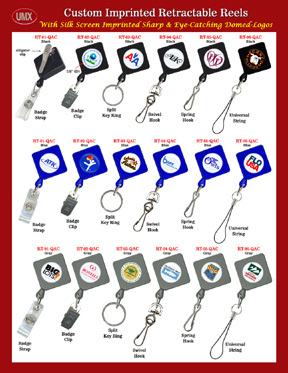 Great for businesses, schools, offices, tradeshows, exhibits, promotional giveaways, special events, organizational fundraisers, reunions, camps, entertainments, sport venues, job site securities, military, concerts, conferences, meetings, and more. 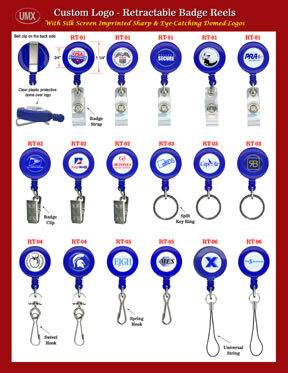 We do custom size, custom color and custom designed logo with laser cut or custom imprint on all of our retractable reels with high quality and eye-catching domed cover! 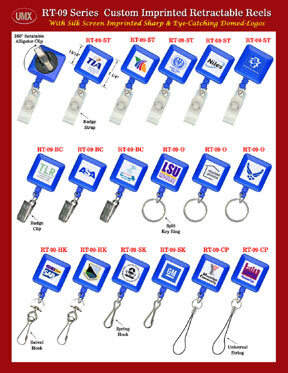 Great For Business, School, Events, Exhibit, Sports, Promotion, Display, Trade Show or Fundraising. Any Pantone Color or Full CMYK Color Custom Printed are Welcome ! Any Graphic or Text Message with Custom Designed Are Free of Art Design Charge ! 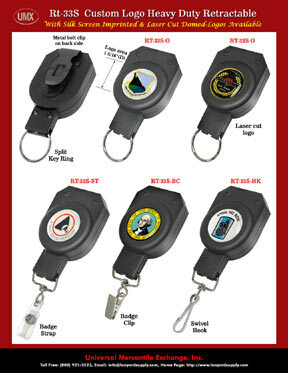 Outstanding Retractable Personalized ID Badges Are Great For Personal or Business. 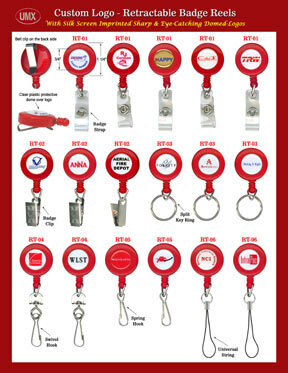 We Can Custom Made Retractable Badges For Any Custom Applications. 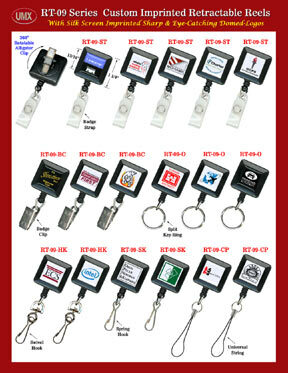 Custom Imprinted Logo/Laser Cut Badge Reels.